I think I’ve stumbled upon the best ice cream I’ve ever eaten in my life; I must send this recipe to Ben & Jerry. Seriously, when I crumbled the pistachio baklava (scratch made from the Mediterranean Market on Ellsworth) into the pistachio ice cream (made with my Krups ice cream/sorbet machine), I could hear the flutter of angel wings. 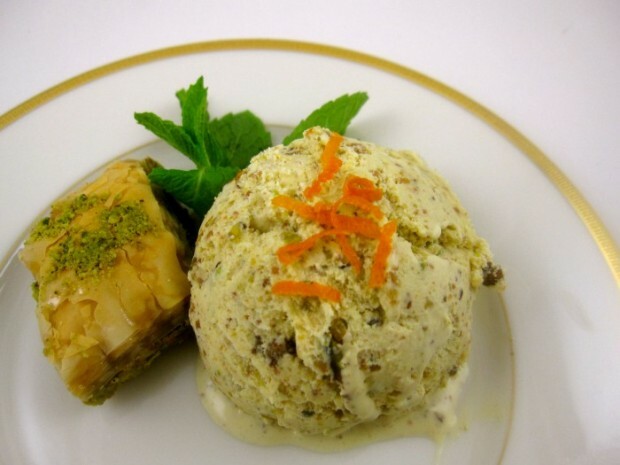 I served the ice cream with the baklava on the side, but the next time I make this, I’ll chop up the baklava and add it to the ice cream in the final stages production. A variation on the Ben and Jerry Cookies and Cream. Brilliant, yes? I adapted this recipe from the cookbook Sorbets and Ice Creams. Every time I pull out my sorbet maker, I pull out this invaluable gem of a cookbook; a source of inspiration for 15 years — only $3.62 (new) on Amazon. This is the perfect dessert to end a Middle Eastern menu; I served this after making Pomegranate Lamb and Grape Kebobs. In a food processor or blender, process 2/3 of the nuts until finely ground. In a double boiler, combine the nuts and half-and-half. Cook over barely simmering water 15 minutes, or until nuts have flavored the half-and-half. 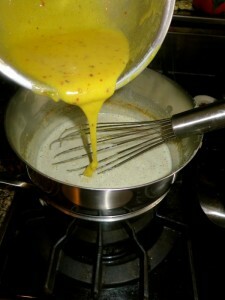 Whisk the 2/3 cup sugar into the egg yolks. Whisk in some of the half-and-half mixture, return this mixture to the pan, and cook over barely simmering water until the custard coats the spoon. Immediately place in a pan of cold water and stir to cool. Stir in cream and vanilla. Cover and refrigerate 2 to 3 hours or until thoroughly chilled. In a small skillet, heat the butter and remaining 2 teaspoons sugar over medium heat. Coarsely chop remaining pistachios and sauté until lightly browned; let cool. Freeze the mixture in an ice cream maker according to the manufacturer’s directions. When partially frozen, mix in the sugared nuts or sprinkle over ice cream when served, or garnish with orange zest, if using.